GS Yuasa Corporation (Tokyo Stock Exchange: 6674; “GS Yuasa”) announced that it had won an order for a high capacity storage battery facility installation project from Chiyoda Corporation, which is engaged in Engineering, Procurement, and Construction (EPC) work in a storage battery system construction project as part of a project for the development of a transmission network for wind power generation that has been planned by North Hokkaido Wind Energy Transmission Corporation. 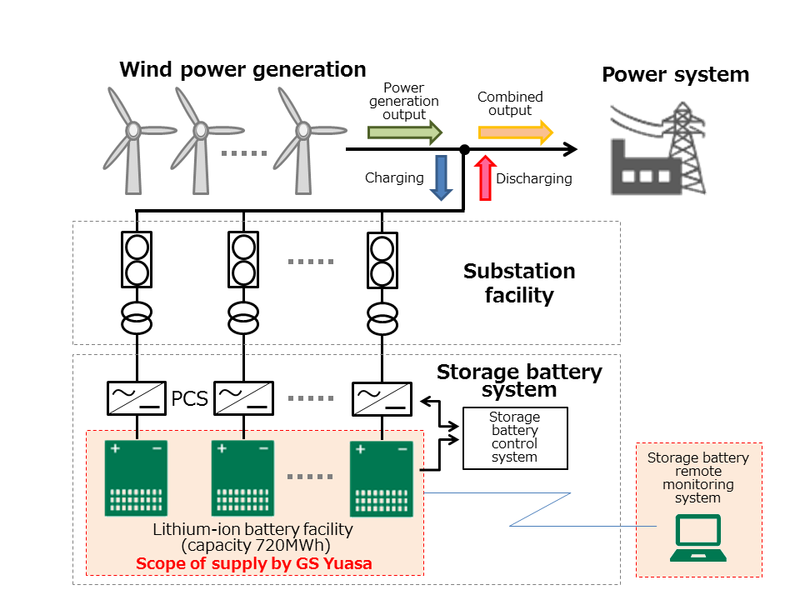 Installation work will begin from FY2020 for one of the world’s largest*1 storage battery facilities with an output of 240MW and capacity of 720MWh*2 at the Kita Toyotomi Substation (Toyotomi-cho, Teshio-gun, Hokkaido, start of operations scheduled for FY2022) that North Hokkaido Wind Energy Transmission Corporation is scheduled to build. This project will use GS Yuasa’s lithium-ion battery facilities in recognition of the highly reliable technical capabilities and long-term support capabilities of GS Yuasa that have been developed up until now. These facilities will contribute to the stabilization of the power system. The lithium-ion batteries (cells) used in these facilities were manufactured by the GS Yuasa Group company Lithium Energy Japan that has an abundant mass production track record for automotive and industrial-use batteries. The United Nations adopted the Sustainable Development Goals (SDGs)*3 in September 2015 to resolve issues faced by global society. All nations need to work to attain these SDGs in order to achieve the targets that have been set in an effort to resolve global issues that include starvation, poverty, and climate change. GS Yuasa believes that contributing to the resolution of various social issues including SDGs and providing value to society through the products it provides and the business activities it is engaged in will also improve the corporate value of its corporate group. This project will contribute to one of the targets of the SDGs, which is clean energy for everyone. Global demand for energy is growing along with the increasing population and economic growth, and increased use of renewable energy instead of fossil fuels with a limited supply such as oil and coals is needed as a result. The introduction of storage battery systems that stabilize output fluctuations is essential for the effective use of energy generated through wind power and solar power. GS Yuasa will continue to work towards the spread of renewable energy and the realization of a sustainable society through projects like these in the future. *3: SDGs is an abbreviation for sustainable development goals. New highly-reliable, low internal resistance, and high energy lithium-ion batteries have been adopted. 1. Makes the storage battery facilities compact and gave them longer life. 2. Enables optimum SOC*4 management, which is important for fluctuation absorbing operation. 3. Achieves energy savings in air-conditioning by controlling the heat generated at charging and discharging. 4. Achieves significant reduction in failure rate and number of replacement parts by having a module structure without cooling fans. 5. Compatible with cubicle that is in compliance with fire prevention ordinances. *4: SOC: State of Charge (charging rate). Rate of residual capacity when fully charged state is 100%. GS Yuasa will guarantee the reliability of this entire system by conducting round-the-clock voltage management and fault surveillance of all the cells, and in case a fault occurs GS Yuasa will utilize its national network to respond to the customer request.